T-Mobile may not be well-known for having the best coverage in the States, but thankfully it knows it and its focus is clearly on making sure that changes. The most immediate-term plans are about getting the right foundation laid. That means rolling out LTE to as many markets as possible, as quickly as possible. In the long term, things look even better for the magenta carrier. It’s much more about making the coverage better, and not just faster or wider. In an exclusive interview with Sascha Segan of PCMag, earlier in the week, T-Mobile’s CTO Neville Ray spoke on a variety of topics, but most predominant was the focus on network. My attention was grabbed by the second page of the interview in which he spoke on future network updates. One of those mentioned was VoLTE. For those unsure what that means, it’s Voice Over LTE. In even more basic terms, it’s the ability to make calls over an LTE connection. Currently, that’s not possible. When you have LTE signal now, when you make a call, your phone connects to the old 2G/EDGE network to make that call. So, you’re still able to make the call, so what, right? Well, actually, it is a big deal when considering the big picture. It’s important because it allows carriers like T-Mobile to shut down their old 2G networks and take back that spectrum, re-using it to make a more efficient 4G network. Simply put, they need that spectrum currently in use by the older network technology to make future networks stronger and faster. Thankfully, T-Mobile has it in its sights. There were no promises on time scale, and no official announcement (as such) has been made, but with the speedy rollout of LTE so far, I can’t imagine it’ll take too long for the carrier to start experimenting and testing. At some point later this year, T-Mobile’s also going to start rolling out its 700Mhz A-block spectrum. Why that’s important is only really understood when you see Tmo’s current networks and issues. At the moment, Tmo uses predominantly mid-high frequency bandwidth airwaves. This is great for speed, but it’s not great when it comes to penetrating buildings’ walls. But that’s not its only issue. Higher frequencies require more towers/masts than the longer wave spectrum to cover an area. Anyone who’s done any basic physics will know the reasons why. Higher frequency radio waves just don’t travel as far as long waves. They run out of energy after a shorter distance, because they spend all their energy creating faster waves. Imagine – if you will – a piece of string. Rest that piece of string on a surface and try to create as many waves as you can in the string. Measure the distance (in a straight line) between the ends of string. Then use a piece exactly the same piece but create about half the number of waves, keeping the waves at the same height, you’ll noticed the string covers a larger distance. Length of string represents the power used to push out the waves. To push higher frequency waves the same distance as lower frequency waves would require a lot more power behind it. The analogy isn’t perfect, but, it captures the essence of why T-Mobile needs these lower frequencies. Lower frequency travels further, requiring fewer towers, reaching more people with less cost, and gets in to buildings better. It’s one of the key things T-Mobile’s missing. And it’s going to be rolling out later this year. As for the deal with Verizon to get the lower frequency spectrum, T-Mobile simply handed over $2.4 billion in cash and spectrum. Verizon has lots of lower frequency airwaves, but needs higher frequency. While – as I’ve already explained – that’s good for signal strength and quality, it’s bad, because Verizon has so many more customers and they’re trying to connect to fewer towers, causing the network to jam up at times and get slow. Verizon got some of T-Mobile’s 1700MHz and 1900MHz spectrum. But, before any of you panic over the fact that T-Mobile still needs it, they only exchanged it in markets where it won’t have any detrimental affect on Tmo’s plans. “We only traded our spectrum in markets where it does not impact our 20+20 MHz LTE capability. And coverage benefits of low band are massive for T-Mobile customers, allowing us to extend the reach and performance of our high performing 4G LTE network,” Ray said. So, in-short: For the year ahead, T-Mobile’s going to be making its coverage better, wider and faster. We’ve already heard plenty on its plans to launch Wideband LTE (its much faster 4G network capable of speeds up to 147Mbps). I highly recommend reading the full interview on PCMag. Once you’ve read that, and watched the interview with John Legere on Yahoo! Tech, you’ll have a great picture on where T-Mobile is headed this year. I’m so happy T-Mobile is talking about this now. They’ve shown in the past that when they talk about stuff, their serious about it. The next couple of years should see incredible coverage improvements. One thing you said, Cameron, was incorrect. When making a call, the device will use either 3G/HSPA+ or one of the lower technologies to make the call. This is why when you’re on 3G you can make a call and use cellular data. This isn’t a new concept… Qualcomm had EV-DV ready to go but both Sprint and Verizon had just invested in EV-DO by that point. If Qualcomm had thought ahead, Sprint and Verizon would have both had simultaneous voice and data much sooner than GSM. As it stands right now, TWO radios have to be running concurrently in order to have LTE for data and UMTS for voice. This is wasteful of both bandwidth and power consumption. While it will use the UMTS/3g/HSPA+ as well, when available. LOL somehow I missed that in the article. My bad. Although in a lot of cases, even with UMTS available, the phone will still drop to EDGE when you get on a call. It happens a lot actually but yes, you’re completely right. Exactly. I was in a place where there was weak HSPA+…and I figured I’d just kick back to 2G instead. There was absolutely no 2G available. Keep in mind, Apalachicola, FL isn’t near any kind of major or minor city, so I’m kind of confused by T-Mobile’s strategy when deploying in semi-rural areas. Obviously, coverage there is new and they had long stopped deploying 2G at that point, but it just makes me wonder. What does it make you wonder about? If coverage there is new, they no longer can deploy 2G equipment because it’s not made anymore. So all you will have is HSPA+. Yeah, I got that, but I just mean it’s exciting that they’re stretching into new areas with new(er) technology. As correct as most of the points in your post are, you’re missing what McC was trying to say. In the article, Cam said that currently to make voice calls, a customer’s handset has to drop to GSM/2G from LTE. This is not the case, as voice calls can also be delivered over UMTS/HSPA. VoLTE will be pretty awesome, though. Two radios are not required nor used on GSM based networks. What’s implemented is a technology called Circuit Switched Fallback. Essentially a page is sent to the device over the LTE network to tell the handset to hand down to the UMTS network, in the event the UMTS network is overloaded or unavailable it will then fall back to GSM.. A properly loaded and running network will Not hand down to GSM 2G and will stay connected to 3G.. T-Mobile just is weak in a lot of areas or are doing network modification and that’s the only reason it would hand down further than UMTS. Your handset is only connected to one network at a time with CSFB. Thanks for that awesome explanation. Totally answers my questions about simultaneous voice and data. It also takes a long time to switch from LTE to HSPA+…much longer than just making a call on 2G or 3G. “We haven’t been talking about building new cell sites in a long while,” Ray admitted. “The story for ’14 is more footprint,” he said. That line right there. That should bring a huge smile to every T-Mobile fan’s face. And Neville doesn’t blow mess around. If he’s saying that in an interview to a major publication, you can be damn sure he’s 100% serious. Man it can’t come true fast enough. Totally. That’s what I’ve been hoping to hear. I’ve always wanted to self-actualize in Montana. Buying US Cellular or at least significant chunks of A Band spectrum is crucial in Tmobile’s next step. I think a better next step is working the FCC on the 600mhz auction, as John is already saying. We weren’t in a position to participate in the 700mhz auctions, but we will be for the 600mhz. We just have to make sure its fair and that we can actually get some even in the face of Verizon and ATT’s deep pockets. We get us a nationwide 10mhz block(or, God willing, more) of 600mhz and we’re really cooking. More 700mhz A-Block would be great, but I think the 600mhz auction is MUCH more important. Yes, it’s more of a wait, but the payoff is tremendously worth it. Here is the problem. Right now Tmobile committed ~$3 billion to the A block. We don’t know how the FCC is going to settle the 600mhz broadcasting bands, but ultimately we know that AT&T and Verizon have more lobbying dollars than Tmobile has (significantly more). What we do know is that there are several players who have more 700mhz A block (which Tmobile has already invested in). that tmobile can either aquire or purchase their spectrum holdings to significantly change their 700mhz A block footprint. Actel covers a significant set of markets in the south, Cavalier Wireless in the northeast and finally US Cellular in the mid-east. Tmobile could become a huge East Coast / West Coast carrier with just the purchases of spectrum from these three wireless companies. All good points. It would be great to just swoop in and buy it from all those players. But are they willing to sell, especially considering the spectrum they’ve been sitting on for years is finally about to get more useful? If they are, then awesome, but even then there’s still the fact that they will want interest on the investment they made to buy that spectrum in the first place. For example, I believe Verizon paid 2.4 billion for the A-Block licenses we eventually purchased from them for 3.2 billion(cash and other spectrum combined). Getting 600mhz from the auction would probably be more cost effective than buying from the “middle men,” as it were. I dunno, we’ll see how it plays out, and I think we will wind up with SOME new 700mhz a-block purchases, just not as extensive as you’re advocating. The problem here is that the value of 600Mhz spectrum is > than 700 mhz spectrum and the “infaltion / interest” pricing of current owners will probably be exactly the same as Verizon’s (30%). Its a known quantity. The 600 mhz spectrum is going to be aggressively targeted by, AT&T, Verizon, Sprint and MAYBE one outside player (China telecom? Dish Network?) As it will be seen as virtually the last possible chance to get into a very lucrative wireless market in the US, without having to buy out a competitor – this means prices for the 600mhz spectrum could be “astronomical” compared to 700mhz spectrum on a more localized basis. I do think tmobile should pursue 600mhz spectrum certainly, but at this point we have no idea when the 600mhz auction will be (it got delayed from 2014 to 2015), we don’t know how much 600mhz spectrum will be on auction (entirely up to the 600 mhz tv licensees at the moment) and we don’t know what chunks they will be delivered in (5+5? 10+10? 20+20?) all being prohibitively more costly the wider the band becomes. I personally do think that if the FCC was serious about competition in the marketplace they would dish it out in 10 + 10 blocks, but the FCC also stands to make a significant profit from the reverse auction and 10+10 isn’t necessarily the most profitable scenario for them. Thanks for your replies. You’re obviously quite knowledgeable in this stuff, so it was great reading. Whatever is the best path to more low-band spectrum for T-Mobile, I’m very optimistic that they will be aggressively going after it. The FCC’s handling of the incentive auction is a big concern. The fact that they have ostensibly been working on it for almost two years, and are – according to the new commissioner – still around 18 months away from running the auction, brings into question the efficiency of the agency in all respects. However, the main concern is that their drive to maximize revenue may, as you say, lead to yet another illogical division of the bandwidth. TM, among others, have also been arguing for a fairer process which will allow the smaller carriers to compete without the prospect of being blown away be the huge reserves that AT&T and Verizon are always able to bring to bear. In the mean time, the current A block acquisition only covers 50% of the population and when you take out the 3-4 markets that are invalidated by adjacent channel 51 services until the incentive auction is completed, the numbers go down even further. They do therefore need to gain access to as many other A block licenses as possible. I hope that, if they can’t acquire them outright, they will be able to work a mutual roaming agreement with the current owners which will help to extend the footprint significantly. The licenses from Verizon will, I think, allow for 5+5 deployment, so VoLTE is essential and download speeds will not be dramatic, but anything in the the HSPA+ speed range will be acceptable, I think, in preference to nothing at all. Actel, LLC spectrum holdings and Cavalier Wireless are crucial too. Southeast Texas is getting brains in that picture. Finally some talk about VoLTE. And creating a larger footprint. Do I hear uncarrier 5? Voice over LTE is easy task for T-Mobile because similar technology has been deployed over Wi-Fi. Band 12 deployment is also important for deep signal penetration. Again, however, both are equally important because Band 12 will be used with LTE and Voice over LTE is required to enable voice calling over this band. Simple since they already have a strong IMS network in place that does the VoIP calls, using IMS for WiFi calls is relatively the same as VoLTE. The issue is the handoff. I wasn’t it as smooth as 3G and lower handles it, if not better. The spectrum that tmobile bought for $308m from us cellular is that low band? AWS if I remember correctly. AWS is used for both HSPA and LTE while Band 12 should be used exclusively for LTE. This map is beautiful! It covers a huge chunk of northeast Pennsylvania, which needs some improvement for sure. My whole area is spotty edge for almost an hour in any direction. Hopefully this spectrum brings wider reaching lte coverage to the area. Cam, for the second time I have seen you comment that the A bock acquisition cost $2.4 billion in cash and spectrum, but I think you need to re-read the TM press release. The value of the spectrum is in addition to the $2.4 billion cash, making the whole deal almost $3.4 billion. I’m hoping to see some cheaper prepaid mobile broadband for Windows 8 tablets and PCs with builtin WWAN. Someone on another forum referred to this 700Mhz A-block spectrum as “scraps” from Verizon. Could anyone explain why it is good/bad spectrum? Is the 700 easy to run interference on? Is a lot of it still in use by Broadcast TV? I would just like to know why this deal was a good deal. There aren’t a lot of options available to TM if they want to improve their signal penetration in the cities. You need sub-1GHz spectrum to be able to get a decent signal indoors and TM never had any. New spectrum only becomes available at the discretion of the FCC and the next big auction for the 600MHz block just got postponed, probably until mid 2015. The top band in the 600MHz range is occupied by channel 51 broadcasters and it does have interference issues with the A block that TM just acquired. In fact, the FCC prohibits wireless use of the A block when there is a channel 51 broadcaster in the area. Thus 3-4 cities (including SF) won’t be seeing deployment until the 600MHz auction (know as an incentive auction, because one of its purposes is to get the broadcasters to move out of problematic bands) is completed and the resulting changes have taken place. Because the A block footprint that TM have acquired covers only just over 50% of the total population, and because of the limitations explained above, it is described as scraps by some commentators. On the other hand, several of the top markets are covered and don’t have interference issues. I haven’t done the math, but I figure that TM will be able to get much better indoor signals to areas covering around 130 million * users before the end of this year. That will be a tremendous bonus, and supports their current strategy of optimizing their customer base in the largest markets. If they can acquire access to other A block spectrum, either by buying licenses from other carriers, or doing mutual roaming agreements with them, they could make a much bigger hit over a similar timeframe. Some people have complained that TM didn’t acquire their own 700MHz spectrum back in 2008 when the FCC ran the auction, but their problem at the time was that they had spent billions acquiring their AWS spectrum in 2006 in preparation for deploying 3G and then had been forced to sit on it until May 2008 because the previous occupants were dragging their feet vacating the band. The 700MHz auction actually took place two months before TM was able to switch on its first 3G market, and owners Deutsche Telekom were not prepared to step up for another auction, which was already heavily loaded in favor of AT&T and Verizon, when they had received zero revenue from their previous investment. In some ways the latest deal is not as good as we could have hoped, it’s expensive (Verizon picked up a big premium compared to the price they paid back in 2008) and the footprint has issues. On the other hand, it’s huge that TM will at last be able to go into large markets like NYC, LA etc and start competing signal for signal with their larger competitors. * Update Having checked the channel 51 broadcast map this number is too high. I hadn’t realized that NYC and LA are apparently on the list of excluded areas. That limits the 2014 target enormously. Thank you for that explanation. Do you know whether or not this band is going to work in Los Angeles? Tmo has to start somewhere with low frequency spectrum. But don’t worry too much about it. In due time, Tmo will get this up and running. Don’t forget the 600MHz spectrum auction next year. Yes it will….but looking at a map of locations with channel 51 broadcasters it looks like it won’t be until after the incentive auction. What exactly does the map represents? I live in Northern California so would that mean? Would we get better coverage or just faster speeds with 20X20? The 700 A-Block that T-Mo bought from Verizon is in those areas. T-Mo still needs to work out deals (eg. Leap before the buy out from AT&T) to fill in missing markets/areas. You’ll likely get LTE all over the area rather than just in cities like it is now. Cheaper mobile broadband plans please. Why would they buy a bandwidth that is in use??? Channel 51 is all over L.A.
Channel will soon be shut down and moved off that spectrum. Sooooo upgrade when they’re both available. It’ll take Apple until the iPhone 6/iPhone 5CS or iPhone 6C until they add VoLTE in these bands. I’m excited for the ability to use the 700MHz LTE in Dallas! I’m sure T-Mobile will get more compatible spectrum this Block A is just a start. it isn’t compatible on much phones. I’m well aware… I won’t be switching until the 6s… but by that time hopefully Apple will have added the 700MHz LTE function for its GSM iPhones or it will have made a new model specifically for T-Mobile US. I think the next big phone launch that may be compatible with this 700MHz spectrum is the Samsung Galaxy S5. I agree, i dont plan on upgrading till like the 7 or 7s. what is the purpose of volte? Uh, Cam said it right in the article. The purpose is to make calls over LTE, as the name (voice over LTE) implies. yeah i know that but would the quailty of the call be anything different? HD Voice is apart of it. Plus it’ll use less battery/power consumption since it’ll use one radio instead of the current two. OK that was what I was thinking voice quality over LTE would be the same as HD voice. The biggest advantage is cost of deployment. At this time, at a single site, we usually have up to 3 technologies: A GSM cabinet, 1 UMTS cabinet utilizing U2100 bands, 1 UMTS cabinet utilizing U1900 bands, and an LTE cabinet. With VoLTE, that would be the only cabinet onsite. Less hardware, less space leasing, and way less cost. Not to nitpick, but wouldn’t one of the cabinets be used for AWS 1700/2100 as UMTS 2100 isn’t really used in the US? Yeah. We just call it U2100 when we work on it. It’s just simpler to reference it that way. Or sometimes we just say AWS and PCS. Off topic question, but the U2100 – for the dual carrier sites, does it take an extra radio module to deploy dual carrier, or can that be done with the same module when you already have single carrier U2100 at a site? Keep in mind that we have a couple of different brands of equipment, the brand I work on all uses the same equipment. However, the equipment cannot transmit both frequency bands at the same time. At least not yet. I was told that in an upcoming release, a single cabinet will be able to do GSM, UMTS (all bands), and LTE. It simply takes the required software license to activate it. able to use it fully,am I correct in this? Thank you whoever answer this. None in the current device line up can use the 700MHz A block spectrum. is a better phone than any Tmo has in it lineup under $200. Again I say under $200. May Moto G,but then I don’t it camera is better than the Amaze. I will just wait then until they have come out with some new ones. I thought of that but my credit it not good for zero down for some crazy reason even those I been customer with Tmo for more than 5 yrs now,I read on here if you are paying customer,with good payment record with you would have no problem,yes I had credit problems in the past,but not with Tmo,so if I want upgrade I will go to Ebay,Swappa,or Slickdeals,Best Buys, buy a midrange Lte phone to see how fast Tmo in NYC, maybe like Lg 6,or the new Alcant phones they have,now I could understand if I was new customer,you would think I was buying car or house,but a phone they can turn off and block from ever being turn on again the USA on their network? Thier lost. They don’t even have towers utilizing that block yet. Like they said at CES and I’ve saif here. It will not take an overnight flip switch thing. This will take months or even a year to get deployed. Yuma Az has enough spectrum to deploy20+20 LTE and HSPA+41 and it is cover under the 700mhz spectrum.But it is still on EDGE.. SMH..
http://gigaom.com/2012/10/03/a-birds-eye-view-of-a-combined-t-mobile-metropcs/ Here are some maps of what tmobile and metro PCS spectum…. Yeah I’m not sure why they never deployed any high speed data in Yuma. They have AWS licenses there. Maybe they’ll deploy LTE with the 700mhz there. How do you know they have licenses here? Yeah, there are several “experts” out there that say and claim things, but offer no citations. Unless I’m missing something, I think you are misreading your source data, or the source itself is incorrect. According to the FCC Spectrum Dashboard, for Yuma County, TM has 15MHz of spectrum under a couple of REA006 – West licenses, another 5MHz under a BEA160 license and nothing for CMA321 which is owned by AT&T. That makes a total of 20MHz owned by TM. Does that mean t-mobile’s phones will be unlocked likes verizons .. since this was the condition imposed by the FTC for using 700mhz spectrum? Nope. Only 700MHz upper block c has the open access rules. Verizon uses that for LTE and T-Mobile got lower block A. Cheaper prepaid mobile broadband please. Well one thing I notice is they left a few places out if you check the Omega Holding Maps. Second next Tmobile should go for a deal to get USC’s A block with some type of 10-20 year roaming deal for USC (if it gets the deal done) or even a roaming deal would do wonders! I edited the above map and added USC’s A block to the map of what the next work would look like with it. Also ATT only has one other A block section in South Car. and with cricket it will be two so I can really see them selling it off for cash / spectrum maybe? i am in NY, very poor indoor reception at 68st and york. please tell me this will do the trick. does it have 700 A band support? You will need a device with LTE Band 12. Nexus devices don’t have wifi calling, unfortunately.. not tmobiles wifi calling i mean. You could use other VOIP services..
No. The N5 doesn’t support LTE Band 12. Are there any GSM devices on the market that support these new frequencies? Question I have is when will t-mobile sell 700MHz phones? I belive they mentioned, towards the 4th Quarter. But who knows maybe sooner. They seem to have been ahead of schedule with certains things as of late. Does the iPhone 5 or 5S,5c have the 700? Or not? The Verizon iPhone 5s model has this band and should support the spectrum when T-Mobile rolls it out. The article mentioned the big advantage is to shut down EDGE, etc for more 4G. What about the areas covered only by 2G/EDGE? Does this imply that TMo would be upgrading the hinterlands at long last. I’ve been around since the Powertel days and it seems little has changed outside city-like areas since the 90’s. I was wondering that as well. I’ve been here since the Voicestream days. We didn’t get upgraded to EDGE until probably 2010.
what are you on now? Still EDGE. We’re only 25 miles outside of an area with LTE. I think the main problem with shutting down EDGE was that sometimes it reaches more places then UMTS can even on the same band, so there needed to be a frequency that could replace EDGE in terms of penetration. voLTE on 700 A block is ideally that solution(where it will be available, anyway). the 700 A block doesn’t cover a lot of areas. mostly highly populated areas (which is the best bang for their buck) that already have LTE coverage. I’m thinking along those lines. This gives tmo the ability to upgrade all of their edge networks to voLTE. Seems a lot cheaper than building an overlapping network over the area which is probably the reason why they haven’t upgraded those areas. not only that, but UMTS/HSPA is HD Voice enabled so its usually a very good calling experience with other HD voice handsets. HD voice is phone hardware dependent and works on the regular 2G GSM network. As long as they implement SRVCC for when LTE isn’t available I’m all for this. is that a fallback mechanism to switch to HSPA/EDGE when LTE signals are weak and drop out or something else entirely? Pretty much. Otherwise you’d lose the call as soon as you leave LTE coverage. I think it was Braxton Carter who had commented that their voLTE network would be backwards compatible – maybe you missed that but I definitely read or watched that somewhere. Wait, so in markets where Verizon got some of T-Mobile’s PCS/AWS waves, T-Mobile lost them? Wtf? That doesn’t make any sense. “When you have LTE signal now, when you make a call, your phone connects to the old 2G/EDGE network to make that call”…. happens only when there are no 4G connections. 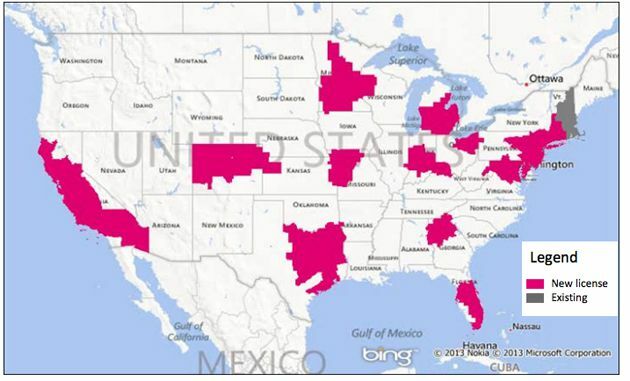 These are the 13 markets Tmobile gained from MetroPCS merger. MetroPCS was the first carrier in the US to launch an Android LTE phone and also the first to have VOLTE. So it makes sense Tmobile is making the best of the situation. Lower frequencies may need more towers for capacity, they are limited to very low channel frequencies also. A 20×20 MHZ network over a 700 MHz network with the next block at 750 and we need the other 10 MHZ for the spectrum. So, the lower frequency is best in rural areas, not in high population cities. What’s next is 600 MHZ band after analog-to-digital TV transition is complete in 2015. I wish Clear wireless would revive on the 600 MHZ band to offer an alternative to the DSL and cable monopolies, but I doubt Sprint will do that because it would compete with their 4G LTE hotspot USb card sales. I’ve been using Clear for the past 2 years and will have no internet anymore in 2015 when the 2.5 GHZ 4G WiMax band used by Clear is shut down by Sprint for Sprint’s 4G LTE. I refuse to pay a penny to cable and I would rather not use the internet than go back to DSL at 768kbps for my rural zipcode. I heard Netflix is taking stuff down because of copy right enfringement claims anyway. I’ll then just only use the internet at school and work. You’ll most-likely receive a new router that works on Sprint’s 800/1900/2500 “Spark” network. This may sound like a ridiculous question, but what about old technophobes who can’t fathom using a smartphone? Does voLTE spell the end of basic voice-only EDGE devices? Or will there be an LTE basic phone? I know many baby boomers and seniors in my family who refuse to get a smartphone.